In some ways, discounting is a pricing concept but really, it’s a marketing concept too. 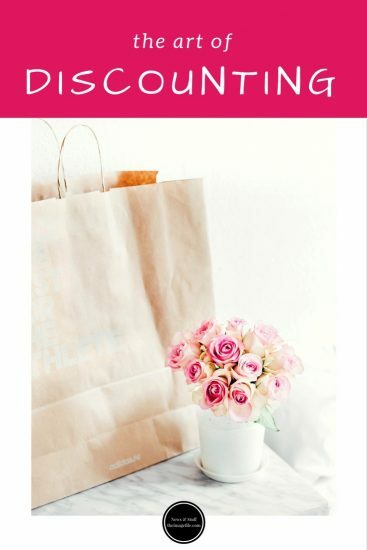 When thinking about using discounts, consider how this discount compares to other promotional marketing strategies that you could implement, for example; promoting products and services on your blog and social media accounts or offering a free gift with purchases over a certain price bracket. A discount or other sales promotion is intended to encourage customers to take action and make an immediate purchase. Many use it to create a sense of urgency and to make customers feel they are getting a special, one-time-only deal. So what are some motivations for offering deals like this to your customer base? Extra purchases. We’ve all fallen for the “buy one, get the second half price” deal. This type of discount gives a perceived sense of value as to the customer they are getting a product for less than normal, but in reality, they are actually spending slightly more than they intended by buying a product they weren’t going to purchase originally. Volume Purchases. A volume purchase discount is when you save more money the more purchases you make. This is usually limited to one type of product, for example; if you buy ten postcards it costs you £6.95 but if you buy twenty it’s £12. Again, this encourages the customer to spend a little more than they intended for perceived value. Rewards. A discount can be used to reward your best customers and many offer top customers a “friends and family” discount on certain products and services to keep them coming back for more. HOW TO OFFER A SALES PROMOTION? When you’ve decided to offer a discount, it’s worth taking some time to craft a strategic approach. Here are a few ideas to get you started. Free shipping. Shipping is an added cost for any customer, so discounting it may encourage customers to impulse buy or fulfil their abandoned shopping carts. Gift with purchase. In this method, also sometimes known as a “premium purchase”, the customer receives something in addition to the main purchase. This is commonly associated with makeup counters where you will receive a tester product as a gift when you make a purchase. Your promotion will only be successful if people know about it, so here are a few best practices to keep in mind when trying to get the word out. Be sure to promote your discount or sales promotion on social media. Make sure you pin the announcement to the top of your feed, as well as sending out the post a number of times throughout the discount period. Include the discount in an email newsletter or set up a unique email campaign just for that promotion. Add a “sale” page to your website so that visitors can easily find your promotions. Used carefully and effectively a discount can help drive sales and acquire new customers.